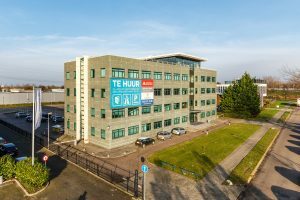 Nexus leases 1,800 sqm of office space in Almere | Nexus Real Estate B.V.
January 2018 – Nexus Real Estate has recently signed three new lease agreements in the Omega office building at the Versterkerstraat 6 in Almere. After becoming fully vacant due to Accenture’s departure in March 2017, the Omega Building is now over 30% occupied within nine months. The Omega Building was fully let to Accenture since 2007. Due to the move of Accenture in March 2017 to Utrecht, the Omega Building became vacant. Nexus Real Estate has converted the building into a multi-tenant concept, in which, among other things, investments have been made in a renovation and styling of the central entrance area and a new access control system. This resulted in the realization of new long-term leases with debt collection organization Syncasso (605 sqm), accountancy organization MTH (566 sqm) and manufacturer of pneumatic and fluid control technologies Norgren (625 sqm). In particular the good accessibility by car, the prominent location along the A6 motorway towards Amsterdam and the high parking ratio at the building, were reasons for these parties to enter into a long-term lease agreement. The Omega Building is part of a larger property portfolio that has been managed by Nexus Real Estate since the end of 2015. Nexus Real Estate has realized these transactions on behalf of the owner of the portfolio.